As a youth he was an honor-roll student, but dropped out of school at the age of 17 and began working for a small-time crack cocaine dealer in Virginia. As a teen he would freestyle rap on the streets of Brooklyn. After making a demo tape with neighborhood friends and connections, this demo was eventually received DJ Mister Cee (from Big Daddy Kane). From there he got notice in Hip-Hop magazine, The Source, in the Unsigned Hype section. Sean "Puffy" Combs got a hold of the demo tape and after meeting signed Biggie to Uptown Records. Puffy eventually started his own music label, Bad Boy Records, bringing Biggie with him. Soon after Bad Boy's premiere he released the album, Ready To Die, eventually selling over 4 million copies. To this day B.I.G. is regarded as one of the best lyricist ever in Hip-Hop along with his one time friend and eventual adversary, Tupac Shakur. (Notorious) BIG, B.I.G, B.I.G., B.I.G. 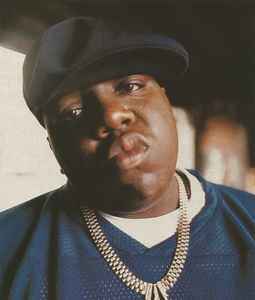 Notorious, B•I•G, BIG, Big Intro, Biggie, Biggie Smalls, Motorious B.I.G, Mr. B.I.G., Natorius B.I.G., Not. B.I.G., Notorios B.I.G., Notorious, Notorious B., Notorious B. I. G., Notorious B.I.G, Notorious B.I.G., The, Notorious B.IG, Notorious B.IG., Notorious Big, Notorious BIG, The, Notorious BIG., Notorious, BIG, Notorious, The, Notorius, Notorius B.I.G, Notorius B.I.G., Notorius BIG, The Notoriou B.I.G, The Notorious, The Notorious B I G, The Notorious B.I.G, The Notorious B.I.G., The Notorious B.IG., The Notorious BIG, The Notorius B.I.G.